Other Activities: Tubing, Cross country skiing, Ice skating, Helicopter tours, Snowmobiling, Heli Skiing/Cat Skiing, FREE mountain guide. Vertical Drop – Kicking Horse offers the 4th highest vertical drop in all of North America for long downhill runs. Chutes – The resort offers 85+ inbound chutes. Eagle’s Eye – Canada’s highest elevation restaurant, Eagle’s Eye, is situated at the top of the mountain. It stands at 7,705 feet (2,350 metres) elevation and can seat 130 indoors. Heli-Skiing – Kicking Horse work closely with Purcell Helicopter Skiing and Great Canadian Heli-Skiing who can both offer a truly unforgettable experience. Scenery – Kicking Horse offers pristine scenery and sheer beauty in the heart of the Rockies. Gateway: Calgary Airport – Kicking Horse. A stunning scenic drive brings you to a world-class skiing destination so well-hidden and unknown that most travelers drive right past… leaving the lucky to enjoy the many pleasures of this undiscovered paradise: Kicking Horse Mountain Resort, the best kept secret in the Rockies! Finding Kicking Horse isn’t hard if you know where to look. The resort is just 1.5 hours west of Banff (145 kilometers) and 2.5 hours west of Calgary (270 kilometers) on the Trans-Canada highway. 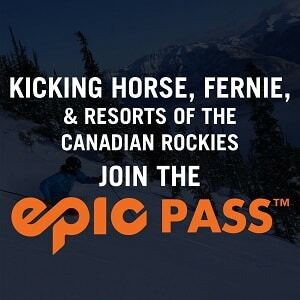 Organising your travel is easy as Kicking Horse has partnered with Brewster Travel Canada to provide daily transfers from the Calgary international Airport and daily ‘ski and ride’ services from Banff. We’re also RV-friendly: park overnight for free!